La Mesa Presbyterian Church (conference room), 7401 Copper, NE. Albuquerque. "Better nutrition today means a better tomorrow for millions of women and children around the world," said David Beckmann, president of Bread for the World "That's why, beginning in 2019, Bread for the World will work with you to mobilize the political will to make this a policy priority and to take a new approach to scale up what we know works in helping improve the nutrition of women and children — including making global nutrition the focus of our 2019 Offering of Letters." Our special guest at the meeting is Kara Bobroff, founding principal of the Native American Community Academy and a new member on the national board of directors of Bread for the World. 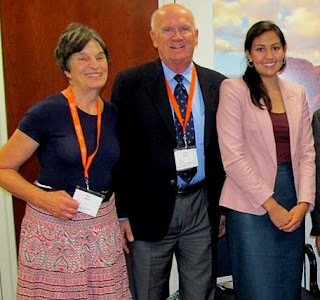 Kara--who would have just returned from her first board meeting in early March--will offer additional information about the OL as well us tell us about her work to promote education among Native youth in New Mexico and elsewhere. She will also discuss her overall vision of how we can come together to address hunger within tribal communities, our state of New Mexico, and our nation. 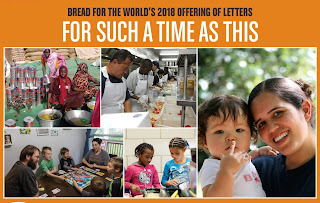 The 2018 Offering of Letters, entitled For Such a Time as This, urges people of faith and conscience to raise our collective voices to urge Congress to invest in and protect key programs that help improve the lives of men, women, and children facing hunger and poverty in the United States and around the world. Our annual Offering of Letters workshop in Albuquerque will focus on the importance of a couple of programs that are crucial to low-income residents of New Mexico: The Supplemental Nutrition Assistance Program (SNAP) and the Supplemental Nutrition Program for Women, Infants and Children (WIC). A handful of special guests have graciously agreed to put together brief presentations to help us understand why it is important to keep these crucial programs funded. Jason Riggs: Manages the SNAP Outreach Program at Roadrunner Food Bank. The program works to reduce some of the barriers that prevent hungry people in New Mexico from participating in this important program. By providing SNAP application assistance and education at food distribution locations, more New Mexicans can become informed about their potential eligibility and learn important information about how they can obtain benefits. New Mexico has an 81% participation rate among eligible SNAP households. There are many barriers that prohibit the remaining eligible 19% from successfully participating in the program. They are often are not informed about the program and have not yet applied to receive them. 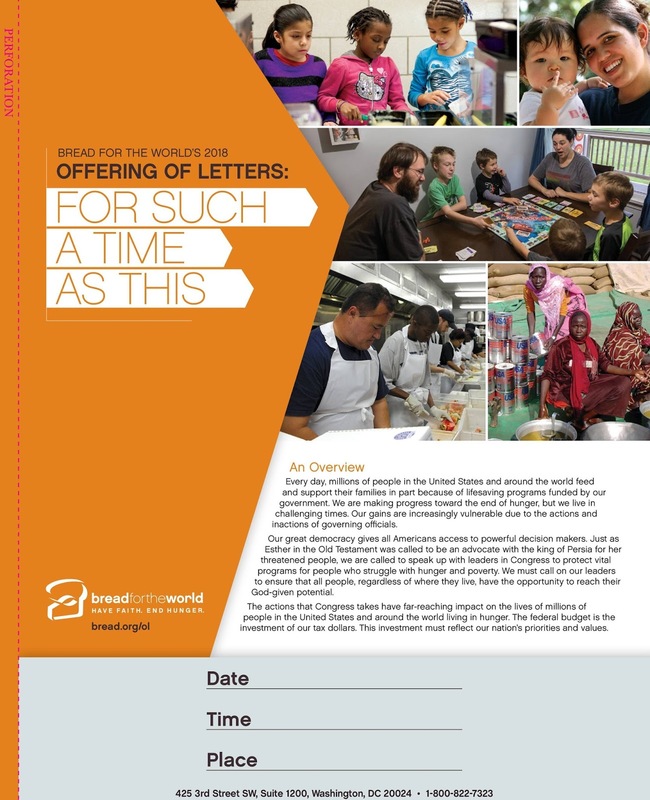 What is the 2018 Offering of Letters About? What is Our Specific Ask to Congress? What is the budget process and timeline? Time and time again, you have called your people to care for those who are hungry and living in the margins. You have given us a world of abundance and we confess that we have not been good stewards and shared justly. We give thanks for the freedom and power you give us to resist this injustice. By writing these letters to Congress today, we use that power in a small way so that we might answer your call to feed those who are struggling with hunger. 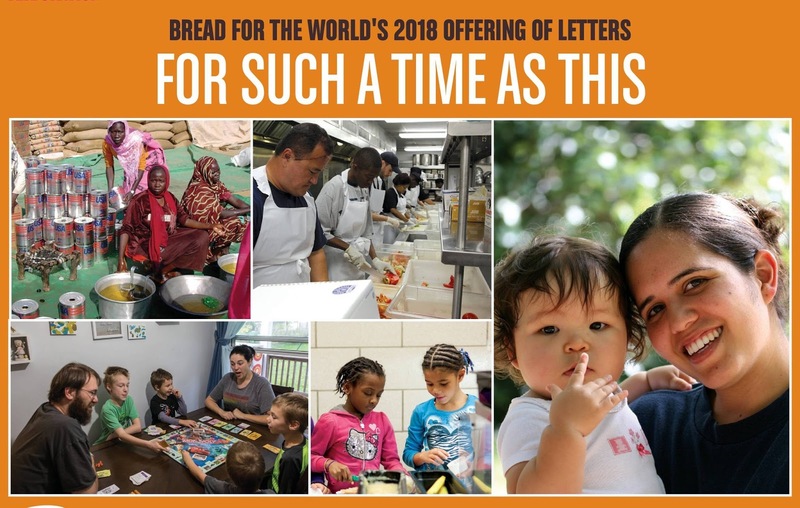 The 2017 Offering of Letters is focused on urging members of Congress to make funding decisions that put our country and the world on track toward ending hunger. We want Congress to fund and protect programs such as SNAP, WIC, international poverty focused development assistance, and tax credits for low-income workers. Download Full Guide and check out the official video for this year's OL. We will view the Offering of Letters video, hold a brief discussion on strategies and the content of the video. As a special bonus, we are planning a panel on congressional visits, featuring local Bread activists Larry and Ellen Buelow; Amanda Dezan, formerly of Oxfam Action Corps and currently with The ONE Campaign; and Patty Keane, former Child Nutrition Reauthorization work group, Legislative and Public Policy Committee. of the Academy of Nutrition and Dietetics. She is currently president of the New Mexico Academy of Nutrition and Dietetics (NMAND). The panelists will give us helpful advice as we plan visits to our local congressional offices on Lobby Day (while Larry and Ellen Buelow visit the Washington offices of our legislators). Please join us on Saturday, March 12, for our 2016 Offering of Letters workshop, at St. Andrew Presbyterian Church, 5301 Ponderosa NE (map) 9:30 - 12:00 Noon. 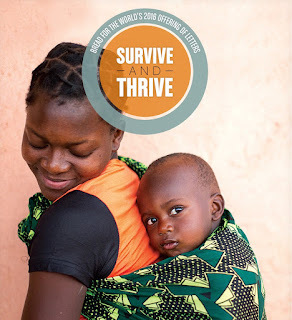 This year's letter-writing campaign, entitled "Survive and Thrive," urges Congress to prioritize support for maternal and child health programs, emphasizing nutrition. We will view the video for this year's campaign, review resource materials and answer questions. 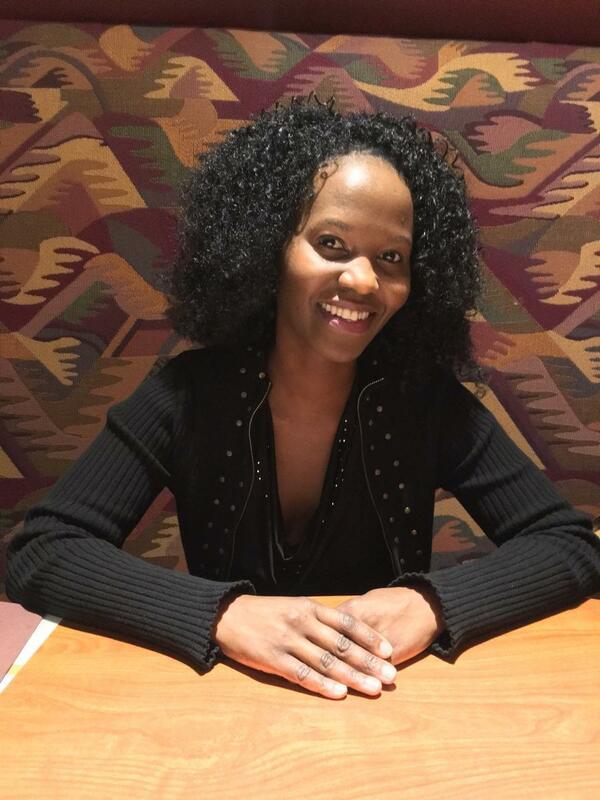 Our featured speaker is Hellen M. Mbithi, a pediatric nurse at the University of New Mexico's Children's Hopsital. Hellen, a member of St. John XXIII Catholic Community in Albuquerque, was born and raised in the small village of Ngai, in the Eastern Province of Kenya(See her full biography below). 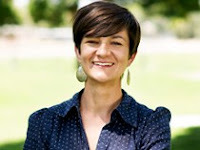 She will tell us more about how a lack of nutrition in for mothers and infants can impact the development of children. Hellen wil also tell us about the challenges of rural communities like hers in finding adequate health care, and how she is working to improve access to medical care in Ngai. In 2015, 20 churches in Albuquerque, Santa Fe, Las Cruces, Gallup and Truchas participated in our Offering of Letters, generating more than 2,000 letters to Congress on an initiative to renew the Child Nutrition Act and protect feeding programs for children. We hope to match or increase the numbers this year, both in terms of the number of participating churches and the number of letters generated to Rep. Michelle Lujan Grisham, Rep. Steve Pearce, Rep. Ben Ray Lujan, Sen. Tom Udall, and Sen. Martin Heinrich. We have created an Event on Facebook for the Offering of Letters workshop. Hellen M. Mbithi was born and raised in the small village of Ngai, in the Eastern Province of Kenya, in Eastern Africa. After completing secondary school, she travelled to the capital city of Nairobi to train as a nurse. After graduating with an associate’s degree in nursing from the Cicely McDonnell School of Nursing in 2003, Hellen worked as a Registered Nurse and Midwife. She worked at Nairobi Hospital and Muthale Mission Hospital between 2003-2006. In 2007 Hellen journeyed to the United States and after passing the NCLEX started working as a RN in Texas. She later worked as a travel nurse visiting several states specializing in dialysis. In 2009, Hellen was attracted to the warm desert climate of New Mexico. She began working at Fresenius Medical care in 2009. 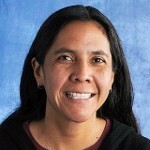 Since 2010, she has also worked in pediatric infusion and dialysis at The University of New Mexico Children’s Hospital. Hellen enjoys taking care of both adults and pediatric patients, compassionately helping those with acute and chronic renal conditions. 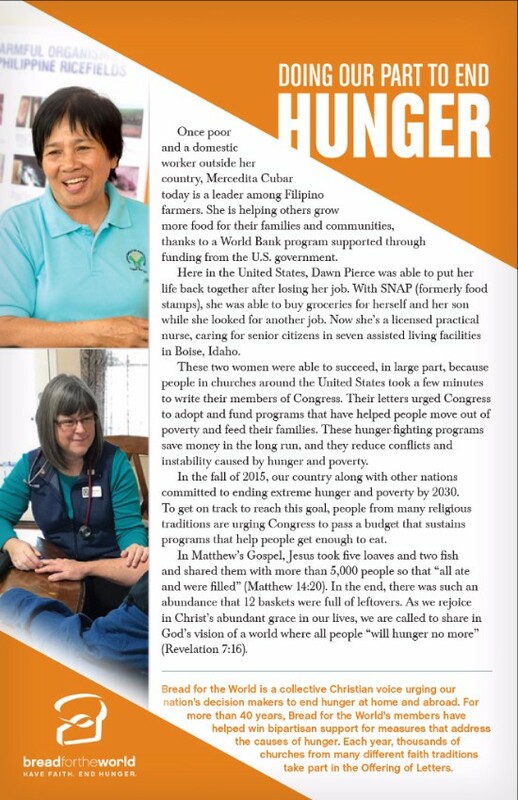 Hellen has a passion to help the poor and the sick. Having lived in Kenya most of her life, Hellen knows first-hand what it feels like to go to bed on an empty stomach. This first hand experience inspires her to work hard to bring needed changes in her village. Having witnessed so many children die of malnutrition, and having witnessed pregnant mothers or their babies being lost in childbirth - Hellen has a passion to save lives as a nurse and a midwife. 1601 S. St. Francis Dr. 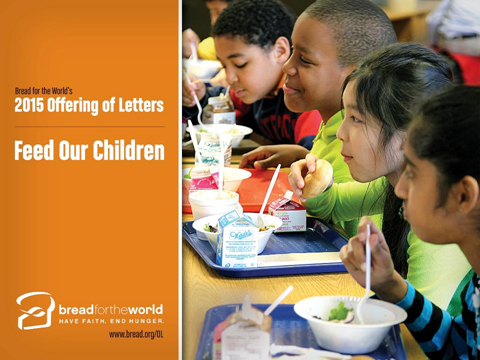 Bread for the World's 2015 Offering of Letters,“Feed Our Children,” urges Congress to reauthorize a Child Nutrition Act that can close the hunger gap. 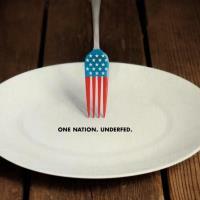 Nearly 16 million U.S. children – one in five – live at risk of hunger. The legislation that Congress is considering this year authorizes several important anti-hunger programs, such as the National School Lunch Program and the Summer Food Service Program. With improved access and investment, we have the opportunity to reach more children in need. urges Congress to renew our federal government’s major child nutrition programs, including those for school meals, summer feeding, and the WIC nutrition program for pregnant and new mothers along with their small children. Our Guest Presenter (Albuquerque Workshop) Nancy Pope, former director of the New Mexico Collaboration to End Hunger and and advisor to several national anti-hunger organizations, will discuss the importance of child nutrition programs. 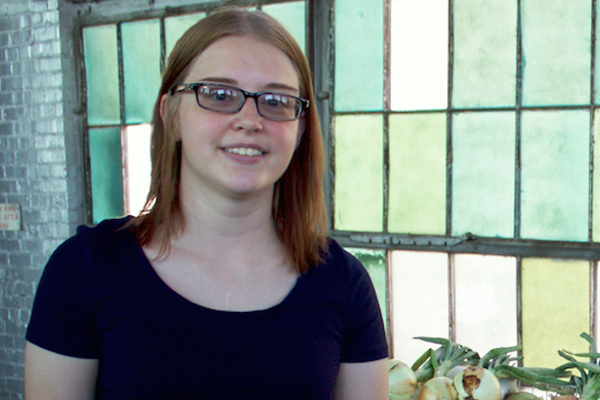 She provides advisory services and interim staff support to non-profits, government agencies and companies who can contribute to ending hunger. Her clients include national organizations (Feeding America, ConAgra Foods Foundation and Share Our Strength) ,corporations (Target), government agencies (State of Maryland), and small non-governmental organizations such as food pantries. 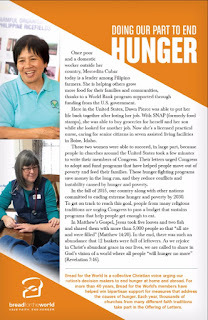 Ms. Pope, a resident of Albuquerque, serves on the steering committee of the Interfaith Hunger Coalition. For more than 50 years, U.S. food aid has benefited more than 3 billion hungry and malnourished people around the world. While the federal government's food-aid programs do much good, smart reforms would help get more food to more people in less time—at no additional cost to U.S. taxpayers. This year's Offering of Letters focuses on much-needed reform to U.S. food aid. 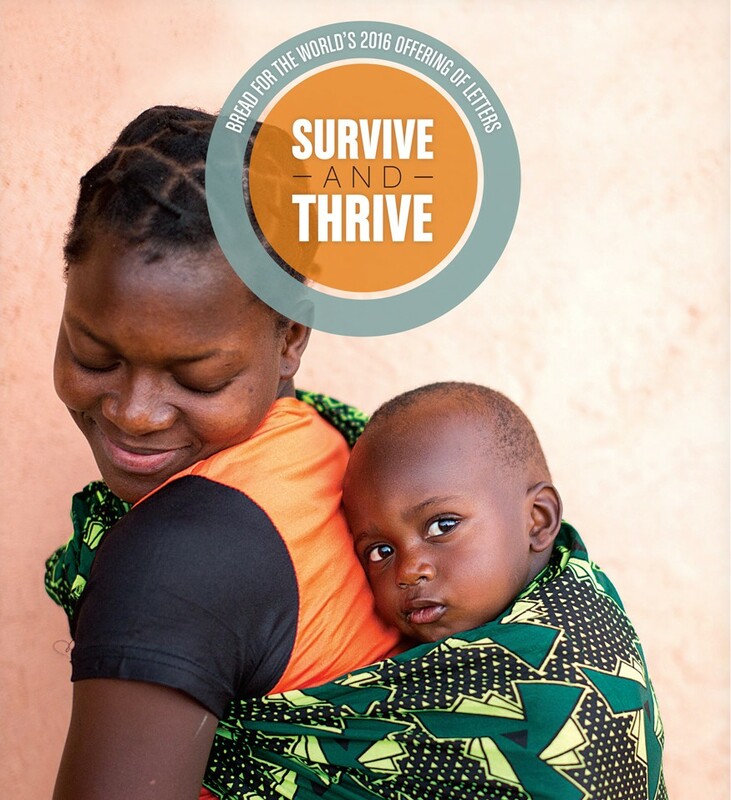 Learn about the United States' role in global aid, and why reform is so critical. Then, write to your members of Congress and urge them to enact much needed reforms to our global food aid programs. This year's Offering of Letters will have a slight twist from previous years. We are linking our letter-writing campaign to a documentary that will be shown in movie theaters around the country That means it might come to Albuquerque (and we have big plans if it does). We will also be signing a petition to President Barack Obama holding him to the promises he made when he was running for reelection. (We would have done the same for Gov. Mitt Romney if he had been elected). There will be much more information to come. In the meantime, here is a synoposis (and a link to a trailer) of the documentary A Place at the Table. In keeping with our theme of the Circle of Protection, Rev. Kay Huggins offered a reflection based on the Book of Isaiah.